Joe Mauer has been one of the best hitters in the game for years. He owns a career .321 batting average and has walked more than he has struck out each year since 2006. His remarkable bat control has made him one of the game’s most valuable players, but questions about his lack of power have always followed him. Listed at 6’5 and 230 pounds, Mauer has the frame of a guy who should be able to drive the ball, but he’s never hit more than 13 home runs in a season. A compact, level swing and an opposite field approach have led him to develop into a really good singles hitter with gap power – until this year, anyway. Since returning from the disabled list, Mauer has slugged eight home runs in 86 plate appearances. His next home run will tie his 2008 season total, and he’s 547 plate appearances away from matching his opportunities from last year. When you see a 26-year-old show a huge power spike like this, the natural assumption is that he’s finally learned to turn on the ball, and is starting to tap into his natural pull power. Of the seven home runs that Hit Tracker has the data for (they’re still working on last night’s shot, I’m sure), five of them have been to the opposite field and two have been to dead center. The grand slam he hit yesterday against the White Sox was to nearly the same spot where he has hit all his other home runs. He has yet to pull the ball over the wall this season. Now, opposite field home runs are great. Having a guy who can take a pitch on the outer half of the plate and deposit it over the wall drives pitchers nuts, and there’s no good way to pitch to a guy like Mauer. However, if we were looking for evidence that Mauer’s power surge in May has been caused by a significant shift in his abilities, we’d be more apt to give credence to the long ball barrage if it hadn’t been built on series of just enough shots to left center field. Mauer’s a great hitter, and he’s having a great month. There’s probably some real power growth being displayed as he’s muscling balls over the wall in left field, but if he ever wants to be a 30+ home run guy, he’s going to have to pull the ball with some authority, and he’s not doing that right now. I love Joe Mauer as a player, but if you were thinking that he’s showing signs of becoming one of the game’s elite sluggers, I don’t think it’s in the cards. He’s a fantastic hitter, but I wouldn’t count on seeing too many more months like this any time soon. We hoped you liked reading Mauer Power by Dave Cameron! I don’t think anyone is expecting Mauer (or anyone else) to have a lot of months like *this*, and I’m not expecting him to hit 40+, but since he’s hit 3 of his 8 to dead center field, and none of his 8 have been “lucky” (and only 3 have been classified “just enough,” by the way), is it crazy to think he’s got legitimate power even though he hasn’t hit any just-enough shots to *right* field yet? Seems to me that a guy who can consistently and legitimately hit it out to the opposite field and to dead center is probably a pretty powerful guy. He’s hit some balls awfully hard to the right side, too–just hasn’t elevated them yet. This is good and interesting analysis, and if he’d hit 8 fly balls that all happened to hook around the LF pole, then that would be one thing. But those three moon shots to center field sure seem to me to tell a different story. I think that’s right on, Bill. Roberto Clemente hit over half of his homers to the opposite, and his totals were consistently in the mid- to upper-20s. If Mauer can equal that, he’s the best player in the A.L. Bar none. Only 2 have been to center. Dave meant the 8th HR from last night was near the cluster to left, not the one in center. It’s on HTonline now, and last night’s is the furthest toward the left-field line. Mauer has always hit home runs to center. 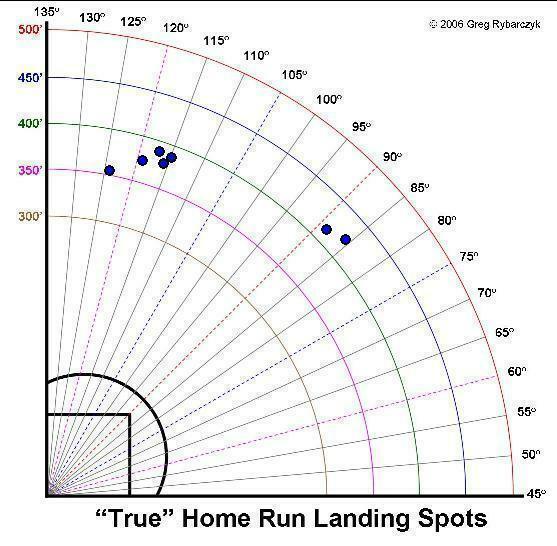 Most of the 400+ foot HR he’s hit in his career (at least as far back as HTonline goes) have been to dead center. He’s also always hit the ball hard, he just tends to drive the ball on a line more than he drives elevated shots. His average HR distance this year is also the shortest of his recorded career (since 2006). It’s not that he’s really hitting the ball farther than he has in the past, he’s just had more go over the wall, mostly to left. This could be a real sign that he is developing more power or an ability to elevate drives more consistently, but as Dave points out, his profile hasn’t really changed. He’s still hitting to the same parts of the field, and the balls he’s hitting out now aren’t really going any farther than the ones he’s hit out in the past. If he’s going to be a true HR hitter, the power to hit it out to center is nice, but it’s always been there for Joe; what he really needs to kick up the HR totals is to hit more balls to places where it will carry out more easily, and he hasn’t been doing that so far this year. Good points, Kincaid. To conclude that “he’s (not) really hitting the ball farther,” though, wouldn’t you have to look at all of his fly balls? When trying to account for the extra homers, wouldn’t it make more sense to conclude that he IS hitting the ball slightly further on a consistent basis? It could be, as has been suggested, that the core strengthening from his rehab is giving him some extra distance. Or it could be that he’s uniquely suited to take advantage of a juiced ball (or whatever’s causing the across-the-board HR rate increases). Maybe he hits a lot of warning track flies at home, for instance. I don’t know even pretend to know the answers to any of these question, but it seems like an in-depth investigation is in order. It would be better to have the distances on all fly balls if they were available. You are right that a shorter average distance on more home runs doesn’t tell us he’s lost any power: more balls that just get over can pull down the average distance even if those are the result of the hitter actually hitting his fly balls farther. Just going by what is available at hittracker, though, his profile appears to fit someone who has the same power as always but whose average distance is pulled down a bit by hitting a few more warning track fly balls out of the park. The increase in HR and the decrease in average distance would be expected to accompany each other if his power hasn’t really changed either way, and in such a small sample, this seems like the most likely explanation. It’s tough to tell this early without more in depth data, though. I’m about three days late in coming back to this, Kincaid, but you’re just wrong about that May 21 HR (as is HTOnline, if that is indeed what it says). I was watching the game, and it was to just left of dead center. You can find the video online (at least theoretically–I can’t get it to work, but the description of the video even says “left-center”). And then of course there was the one last night, well back into the upper deck of RF. You can talk about his profile and such all you want, but if you watch him, he really is hitting the ball a lot harder. And *swinging* a lot harder. And the fact that his HR themselves aren’t going much farther (if true) doesn’t mean a lot if he’s hitting it that far four times as often. I’m about the biggest fan of this site and this sort of research that there is, but sometimes it really is as simple as it looks. HT does have it as pretty far down the line. I just watched the video of it, and it does seem to be further toward the gap, a bit to the right of the big cluster he has on the graph Dave posted. But it was nowhere near dead center either.